You can make a statement piece of origami wall art with Sonobe units–they are simple to fold, resulting in an impressive artwork to display in your home. There are many different ways to use Sonobe units; the most popular object to make using 6 units is the origami unit cube. Sonobe units are thought to have been invented by Toshie Takahama and Mitsunobu Sonobe in the 1960's, but the details are not known. 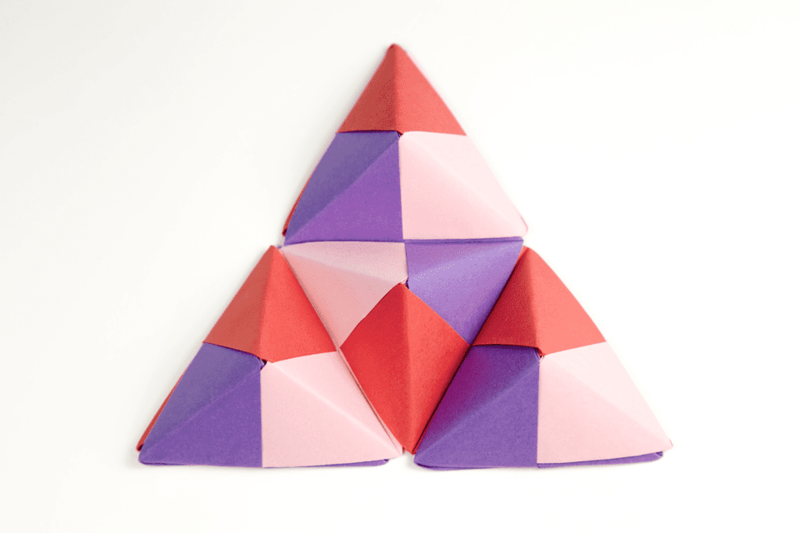 For this tutorial, we'll be making a triangular shape using 9 Sonobe units. Start with a piece of square-shaped paper, white side up if it has one. Fold the bottom edge of the paper up to the top and unfold, creating a horizontal crease. Next, fold the top and bottom edges to the central crease. Fold the bottom right corner diagonally up. Fold the top left corner diagonally down. Unfold the two previous diagonal folds. You are left with little diagonal flaps on the bottom left and top right. Unfold fully, so you're back to the beginning. Re-fold the bottom left and top right diagonal flaps, making sure that they align with the horizontal crease. Next, re-fold the bottom edge up. Re-fold the bottom right corner diagonally up. Next, re-fold the top edge down. Now re-fold the top left corner diagonally down and slot the flap underneath the bottom left section, carefully. Tips: If you followed all the steps carefully, you should have no problems moving forward. If yours looks a little wonky, it would be worth folding it again, as the final results heavily depend on good crisp folding. Flip the unit over to the back, from left to right. Fold the bottom corner up to the top right corner (on a diagonal), aligning with the right edge. Next, fold the top corner down to match the bottom one. Flip the unit over from left to right. Crease the unit in half, along the line that runs diagonally from top left to bottom right. Your unit is complete–you will need 9 of them if you are making a triangular wall display. For this tutorial, we used 3 sets of 3 matching colors. Take 3 of your units, and arrange them as shown, tucking the end of one unit under the fold of another. Slot them all together. If you are aiming for a color-coordinated effect, make sure the order of colors is the same each time. In this case, it's blue, yellow, green. Do this for all of your units. Once you have all 3 sets of units completed, you can slot them together. Again, keep the color order: blue, yellow, green. Now that you have your 9 units assembled, you can keep adding more units, creating larger geometric shapes such as a hexagon, slanted rectangle or uneven shape. Once you have your desired shape completed, carefully flip your units over to the other side. You can either fold the ends over and glue them inside or trim them off. To mount them on a wall, use a piece of stiff cardboard or foam board; you can cut it to the same size as your wall art by tracing around your assembled sonobe units on the board and then cutting it out. You can use PVA glue or a hot glue gun to attach your art to the board. 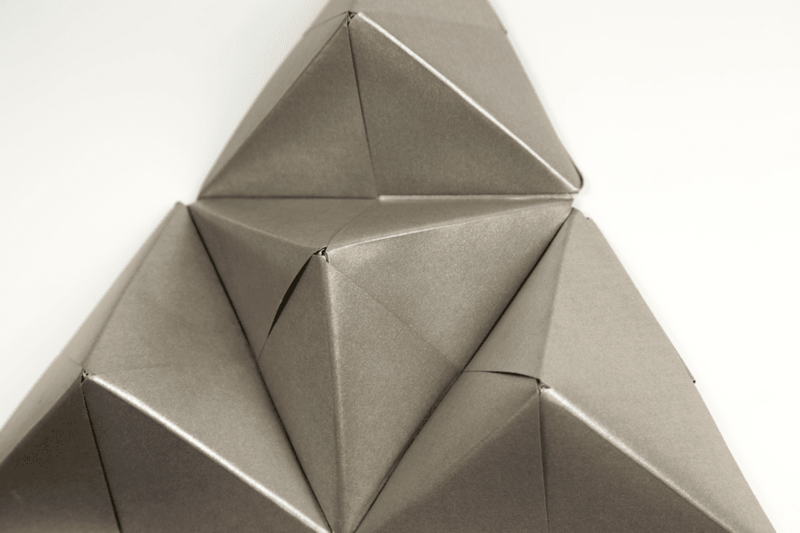 You can achieve a standout piece of origami wall art by using large paper to make the units—in this example, 30 x 30 cm metallic paper was used. Alternatively, use small sheets of crisp white paper to create your wall art. It may be more time consuming, but the result is a very detailed piece of origami wall art—a perfect statement for a dining room or lounge room. A good number of units for such a piece would be 100 units! So grab a friend or partner, teach them how to make the units, which will cut your time in half, and the final artwork will be a great reminder of your friendship.